The eggplant is neither oval in shape nor white, and certainly bears no relation to the egg in taste or in usage. “Eggplant,” then, is a misnomer? Well, almost. The first eggplants to reach Europe during the Middle Ages were actually a rare white species, with oval fruits that closely resemble a hen’s egg. The name eggplant was a natural, and stuck to the plant even when the more common purple varieties made their appearance in Europe. Fruit? Yes, the eggplant is botanically a fruit, although the plant is used almost exclusively as a vegetable. The eggplant is, to be exact, the Solanum melongena, a member of the nightshade family closely related to the tomato and potato. Specimens range in size from the large fruit eaten in America to tiny Near Eastern varieties which happen to be more strongly flavored than the eggplants we customarily enjoy. In addition to the familiar purple variety, there are white and yellow varieties, and a dwarf species whose fruits grow only three or four inches long. A peculiar variety called the snake eggplant produces narrow, elongated fruits up to a foot in length with their ends curled up like a serpent’s tongue. The eggplant originated in India and eastern Asia, and has been cultivated since remotest history. One of the oldest references to the fruit appears in a fifth-century Chinese book, which describes how fashionable Oriental ladies used a black dye made from eggplants to stain and polish their teeth. The “mad apple” has been a particular favorite in the Near East since Biblical times. The ancient Persians stuffed eggplants, and the Arabs scorched them over charcoal and crushed the flesh into a puree. During the early Middle Ages, the Arabs brought the eggplant to Spain and Greece. The fruit was first mentioned in northern Europe by Albert of Cologne in the thirteenth century, but it was not well known there until the sixteenth century. The first eggplants began appearing on English dinner plates around 1587. Initially, the English called the fruit “Guinea squash,” since it was brought to London by traders in West Africa. The Spaniards brought the eggplant to America during the seventeenth century. But most of the eggplants grown here until this century, were used exclusively for ornament. The eggplant, incidentally, is one of the few items of produce grown in the United States that also thrives in the tropics. Eggplants are now extensively cultivated in east and southern Asia, as well as in Africa, South America, southern Europe, and the United States. Requiring strong, steady sunshine, the plant is rarely grown outdoors in England or northern Europe. Most American eggplants come from Florida, Texas, and New Jersey. About a million and a half bushels of eggplants are produced here each year, and smaller quantities are imported, chiefly from Mexico. But the average American, by and large, shuns the eggplant, consuming but four ounces of the fruit per year. Eggplants are edible from the time they are one-third grown, and are usually picked before they reach maturity. Plants are often started in protected beds, then transplanted to the garden or field. Ripe eggplants are eaten raw, pickled, or cooked. The cooked fruit is favored for its similarity in texture to meat, and many dishes, the Italian Eggplant Parmigiana, for instance, are prepared like meat dishes, with cheese, sauce, and spices. The versatile eggplant can be baked, broiled, scalloped, fried, sauteed, stuffed, or marinated. Italy, Greece, France, and several eastern countries all have their favorite eggplant dishes. In the Near East, large eggplants are stuffed with meat, or pureed into a dip, or diced and mixed with onions, tomatoes, and garlic. The Italians like to slice the fruit and saute it in olive oil, with plenty of tomato sauce. A Sicilian specialty is melanza caponata. The French enjoy ratatouille, a baked vegetable casserole with tomatoes, peppers, onions, and zucchini. Many Japanese dishes call for eggplant. In fact, the eggplant is the fourth most important “vegetable” in Japan, after the sweet potato, radish, and Chinese cabbage. The popular Greek dish moussaka, made from eggplant, lamb, onions, and spices, originated in the early Middle Ages. 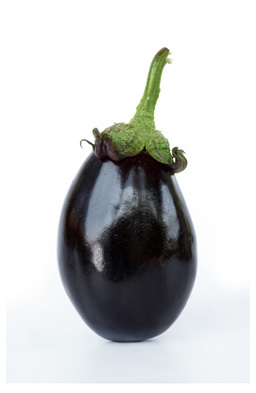 When you shop for eggplants, look for firm fruits of uniform color. The best eggplants are heavy in relation to their size. Avoid wilted or soft eggplants, or fruits marked with brown spots which may indicate decay. “Mad apples” are also excellent plants for a kitchen garden, so you might test your purple thumb with a small crop. Experts advise that you start the seeds indoors and transplant them to the garden only when the daily temperatures reach the seventy-degree range. They say you can serve eggplants with any dish. How about eggplant and eggs? How Poisonous Is the Nightshade Family Of Plants Like Potatoes, Peppers, Eggplants and Tomatoes?